The torque arm rear suspension system. Torque arm suspensions have been stock on many cars for a long time, from the 1930s to the current day. It works well as an all-around type of suspension. Camaros and Firebirds from 1982 to 2002 used this type of suspension and performed great! This suspension system has a long arm that runs from the center of the differential to the output of the transmission to keep the axle from twisting and to keep pinion angle constant. This kind of suspension always has some kind of panhard bar to keep the axle centered. Advantages: If Heim joints are used in it's construction, the suspension has almost no bind, much like a 3 link suspension. Since the torque arm is lower, it's easier to add to a car that wasn't offered with it since it doesn't need as much space. You usually don't have to cut the floor to add one. It's also easier to route a full exhaust around it. 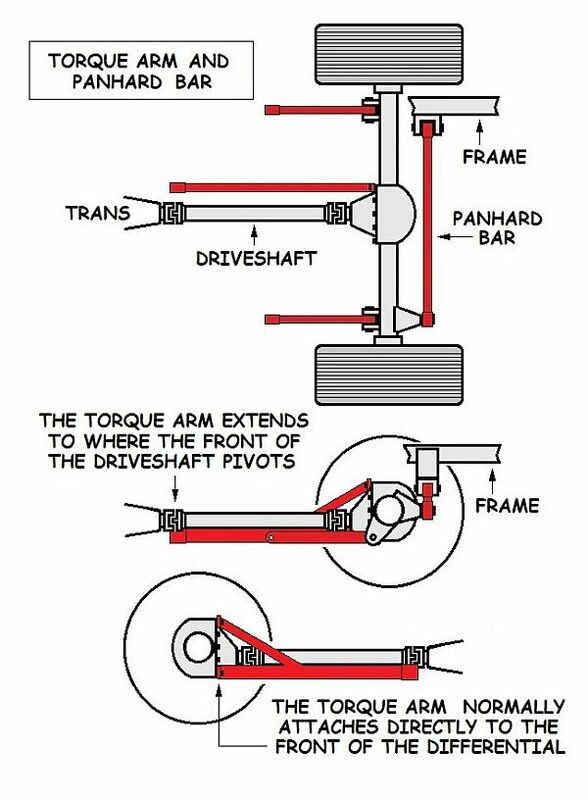 Disadvantages: The length of the torques arm, the lower links and where they are attached to the chassis are critical for this type of suspension to work and ride properly. If you plan on fabricating one, you really need to understand the geometry in factory applications and try to mimic them. Another disadvantage if you are going to swap in a torque arm suspension is difficulty and cost. You will also need to have some welding and fabrication skills.